Our Etched In My Heart Marble Urns are truly a work of art. 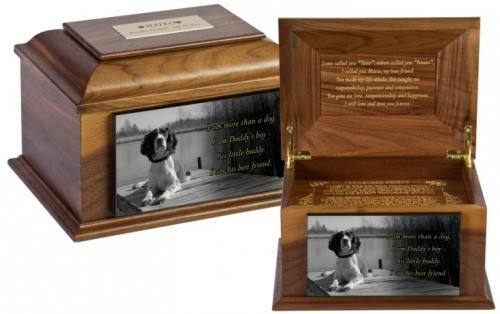 The urn can be customized as much or a little as you like to reflect the bond you shared with your beloved companion. Your pets photo is etched on a high gloss marble giving the appearance of an extremely life like representation of your pet. This marble is very rare and difficult to find as it contains no veining. Traditional marble contains white vertical lines referred to as veining. These lines are a result of phosphorus deposits. With our marble all you see is a high gloss finish with impeccable detailed engraving. Personalized inscription on the marble can be etched in Gold or Silver Tone inlay for a more brilliant contrast. The Athena urn is made solely in America and individually handcrafted by a local wood maker from solid Walnut, Cherry or Maple American hardwood. You may choose to have a Personalized Rainbow Bridge Poem engraved into a wooden memorial tray. The memorial tray can hold small items such as a collar or favorite toy. Photo frames can be engraved with your heart felt saying for further customization. Need a little help? We have over 24 poems and quotes to choose from. Celebrate your pet”s life! Let us help you commemorate and preserve the memory of your pet; honor the bond you shared. This marble is very rare and difficult to find as it contains no veining. Traditional marble contains white vertical lines referred to as veining. These lines are a result of phosphorus deposits. With our marble all you see is a high gloss finish with impeccable detailed engraving. Personalized inscription on the marble can be etched in Gold or Silver Tone inlay for a more brilliant contrast.